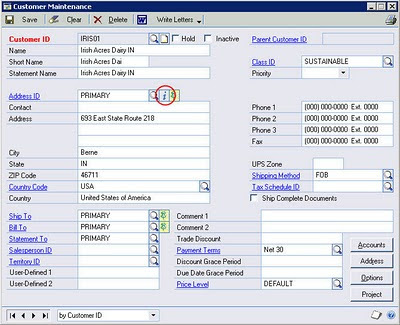 One of the major changes to the Microsoft Dynamics GP user interface occurred with the release of version 10.0. This change was from the MDI (Multiple Document Interface) to the SDI (Single Document Interface). Version 9.0 had a single application window in which multiple child (document) windows could be opened. This single application window would show as a single entry in the Windows Start Bar. Version 10.0 has a main application window, however now all the child windows open as independent windows which show on the Windows Start Bar. Each single window (document) has its own interface. GPWindow: Where's that GP Window? Not one to rest on his laurels, Jivtesh has added a new feature to his already amazing GPWindow.com site. Have a look at the Where's that GP Window? link to see what new shiny toy Jivtesh has given us. Why can't I discard changes on a Transaction? I saw a newsgroup posting today asking this common question. You might ask "Master records like Customers and Vendors let me discard changes, so why not transactions?" There is no discard/undo/cancel changes functionality on most (if not all) transactions within Microsoft Dynamics GP. Why is it so? Well, there is a simple technical reason for this.... Referential Integrity of the Data. Have you ever noticed the little i button on various cards within GP and wondered what it's for? This is called the 'Internet Info' button and is used to access the Internet Info window, where email addresses, websites, images, and other electronic information specific to the particular master record can be stored. Setting up a new installation recently I wanted to prevent both the 'Metrics' and 'Outlook' sections of a new user's home page from loading. I've read solutions about running a SQL statement against the Users Master (SY01400) in the Dynamics database, but I wanted it to prevent it from happening in the first place rather than going back and changing it after the users had been set up. A number of years ago when I was working closely with the Great Plains development team in Fargo, I heard that everyone on the team had been given a book to read. This book would help the team understand why it is important to work with designers when creating software, especially the user interface.